The RAA is now collaborating with Riverside Rhythm & Rhyme, and you can attend their monthly performances at the theater! 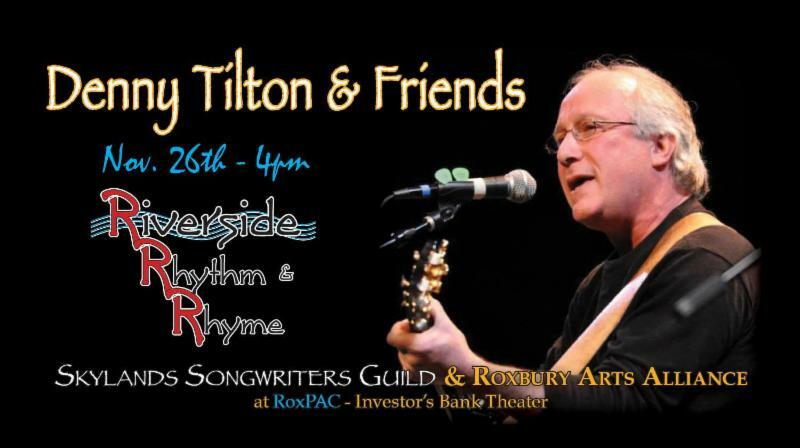 This month’s RR & R showcase features Denny Tilton & friends. Joining Denny will be Tom Askin on keys and Don Elliker on "many strings" plus other surprise guests!! "Hometown Hero" Denny Tilton's thought provoking songs touch the heart and speak to fans of all ages. Denny's 2015 release "Anticipating Flowers" has a warm inviting feel and encompasses an array of styles including folk, country, pop, and ragtime. The album features members of Railroad Earth and From Good Homes - so you never know who might be part of this night's "friends"! "Reportedly one of the nicest players in the area music biz, Tilton tells his tales ...in a sincere, 'this is the way it is' zen fashion. Opening for (and playing with) Denny will be Don Elliker! An "XPN Welcomes" event and a presentation of Skylands Songwriters Guild and Roxbury Arts Alliance.